This essay explores immigrants’ bilingual humor viewed as part of secondary language socialization. Adult acquisition of a new language involves reflections about languages and language play which juxtaposes and compares the mother tongue with the language of the receiving society. Acquiring a new language, émigrés do experiments with the form and create new meanings. In the early stages the bulk of bilingual humor is based on simplest interlingual puns exploiting minimal pairs, malapropisms and discovery of obscene words in foreign lexis. As immigrants’ proficiency in the language of the host society increases, their humor becomes more sophisticated focusing on social criticism and in-group solidarity rather than on mere juggling of phonetically similar words. 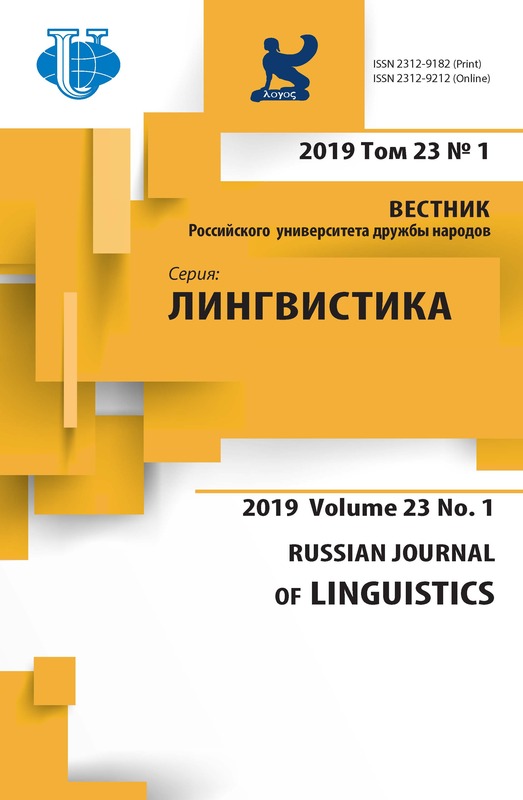 Texts analyzed in the article testify that the Russian language has preserved its symbolic value among new Israelis and they use bilingual humor as a warning against the first-language attrition. bilingualism, humor, pun, language play, reflections about language, code-mixing. Berry J.W. 2013 Immigration, acculturation, and adaptation // E. Tartakovsky (ed. ), Immigration: Policies, challenges and impact. New York: Nova Science Publishers. P. 195-211. Moyer M.G. and Rojo L.M. (2007) Language, migration and citizenship: New challenges in the regulation of bilingualism // In M. Heller (ed. ), Bilingualism: A Social Approach. London: Palgrave Macmillan. 2007. P. 137-160. Apte M.L. Humor and laughter: An anthropological approach. Ithaca, N.Y.: Cornell University Press. 1985. Bell N. Formulaic language, creativity, and language play in a second language // Annual Review of Applied Linguistics. 2012. № 32. P. 189-205. Davies C.E. How English-learners joke with native speakers: An interactional sociolinguistic perspective on humor as collaborative discourse across cultures // Journal of Pragmatics. 2003. № 35. P. 1361-1385. Warner Ch. It’s just a game, right? Types of play in foreign language CMC // Language Learning and Technology. 2004. № 8(2). P. 69-87. Jacobson R. Closing statement: Linguistics and poetics // In T.A. Sebeok (ed. ), Style in Language. Cambridge, Mass. : MIT Press. 1960. P. 350-377. Cook G. Language play, language learning // ELT Journal. 1997. № 51/3. P. 224-231. Ben A.D. The “Myth” of Jewish humor // Western Folklore. 1973. № 32. P. 112-131. Davies C. Ethnic Humor around the World: A Comparative Analysis. Bloomington and Indianapolis: Indiana University Press, 1990. 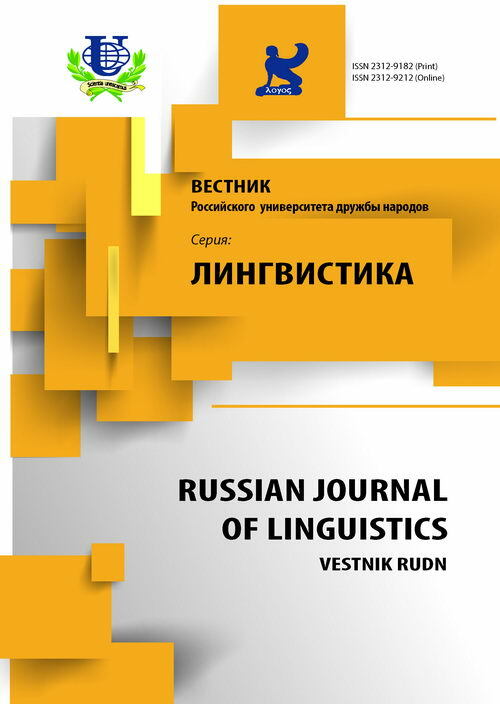 Yelenevskaya M. “Ours abroad” As a theme of humor on Ru.net: Changing values, competing loyalties // Russian Journal of Communication, Special Issue, The Russian Anekdot As Cultural Genre, Discourse and Performance. 2009. № 2 (3/4). P. 267-287. Протассова Е. Юмор в русскоязычной прессе Финляндии // Диаспоры. 2006. № 4. С. 53-70. Lefcourt H.M. and Martin R.A. Humor and life stress: Antidote to adversity. New York, Berlin, Heidelberg, Tokyo: Springer-Verlag, 1986. Lefcourt H.M. Humor: The psychology of living buoyantly. New York: Kluwer Academic, 2001. McGhee P.E. Humor development: Toward a life span approach // In P.E. McGhee and J.H. Goldstein (eds. ), Handbook of humor research: Basic issues. New York: Springer Verlag, 1983. P. 109-134. Attardo S. Linguistic theories of humor. Berlin: Mouton de Gruyter, 1994. Raskin V. Semantic Mechanisms of Humor. Dordrecht: D. Reidel, 1985. Baraban E.A. Reconciling smile: Humor in the detective series Streets of Broken Lights // In O. Mesropova and S. Graham (eds. ), Reinvented? Humor and Satire in Post-Soviet Russia. Bloomington: Indiana, 2008. P. 145-158. Morreall J. Enjoying incongruity // Humor. 2001. № 2/1. P. 1-18. Hay J. The pragmatics of humor support // Humor. 2001. № 14/1. P. 55-81. Chapman A.J. Humor and laughter in social interaction and some implications for humor research // In P.E. McGhee and J.H. Goldstein (eds. ), Handbook of humor research: Basic issues. New York: Springer Verlag, 1983. P. 135-158. Еленевская М. Юмор и насилие: смеховая культура иммигрантов из бывшего СССР в Израиле // Е.Э. Носенко (ред.) Израиль глазами «русских»: культура и идентичность. М.: Наталис, 2008. С. 35-59. URL: http://madan.org.il/node/903. Aarne A. and Thompson S. The types of the folktale: A classification and bibliography. Helsinki: Suomalainen Tiedeakatemia, 1964. Leeds Ch. Bilingual Anglo-French humor: An analysis of the potential for humor-based on the Interlocking of the two languages // Humor. 1992. № 5(1-2). P. 129-148. Gruner Ch.R. The game of humor: A comprehensive theory of why we laugh. New Brunswick, USA and London: Transaction Publishers, 1997. Haney P. Bilingual humor, verbal hygiene, and the gendered contradictions of cultural citizenship in early Mexican American comedy // Journal of Linguistic Anthropology. 2003. № 13(2). P. 163-188. Davies C. Searching for jokes: Language, translation, and the cross-cultural comparison of humour // In T. Garfitt, E. McDonald, and J. Taylor (eds.). The anatomy of laughter. London: Legenda, 2005. Шмелева Е.Я., Шмелев А.Д. Русский анекдот: Текст и речевой жанр. М.: Языки славянской культуры, 2003. Sommer D. Bilingual aesthetics: A new sentimental education. Durham and London: Duke University Press, 2004. Санников В. Русская языковая шутка. От Пушкина до наших дней. М.: Аграф, 2003. Новиков В. Филологический роман: Старый новый жанр на исходе столетия // Новый мир. 1999. № 10. URL: http://magazines.russ.ru/novyi_mi/1999/10/novik.html. Крысин Л.П. Русское слово, свое и чужое. Исследования по современному русскому языку и социолингвистике. М.: Языки русской культуры; М.: Языки славянской культуры, 2004. Yelenevskaya M. Russian: From socialist realism to reality show // In J. Rosenhouse and R. Kowner (eds.) Globally speaking: Motives for adopting English vocabulary in other languages. Clevedon, U.K.: Multilingual Matters, 2008. P. 98-120. Шапошников В. Русская речь 1990-х. Современная Россия в языковом отображении. М.: МАЛП, 1998. Spolsky B. and Shohami E. The languages of Israel. Policy, ideology and practice. Clevedon: Multilingual Matters, 1999. Еленевская М.Н., Фиалкова Л.Л. Русская улица в еврейской стране. Исследование фольклора эмигрантов 1990-х в Израиле. В 2 т. М.: ИЭА РАН, 2005 (см. полный текст на URL: http://old.iea.ras.ru/books/dostupno.html). Miles W.F.S. (1998) Linguistic cohabitation: Frenglish in the Mauritius press // Language problems and language planning. 1998. № 22 (3). P. 237-253. Gladstein M.R. Bilingual wordplay: Variations on a theme by Hemingway and Steinbeck // The Hemingway Review. 2006. № 26(1). Р. 81-95. Еленевская М. Как быть чужаком: языковое поведение в иноязычной среде сквозь призму народной лингвистики // Studia Linguistica. Антропоцентрическая лингвистика: Проблемы и решения. 2012. № XXI. С. 143-152. URL: (http://ephil-herzen.com/wp-content/uploads/2012/07/studia21.pdf#page=143). Черняк В.Д. «Слова, которые мы не знаем», как примета речевого портрета современной языковой личности // В кн. И. Купина (ред.) Культурно-речевая ситуация в современной России. Екатеринбург: Уральский государственный университет, 2000. C. 319-322. Van Deussen-Scholl N. Toward a Definition of Heritage Language: Sociopolitical and Pedagogical Considerations // Journal of Language, Identity and Education. 2003. № 2(3). P. 211-230. Низник М. Преподавание русского языка в Израиле: попытка разрушить стереотипы // В кн. М. Кенигштейн (ред.) Русское лицо Израиля: черты социального портрета. М.-Иерусалим: Мосты Культуры (Гешарим), 2007. С. 403-420. Copyright (c) 2014 Еленевская М.